Baccalà, or salted codfish, is bound to make an apparence on the Christmas Eve table of many Italians. And for those who observe Lent, it is a standby for meatless Friday meals. Baccalà marries especially well with tomatoes, and who does tomatoes better than the people of Campania, home to Italy’s best tomatoes? 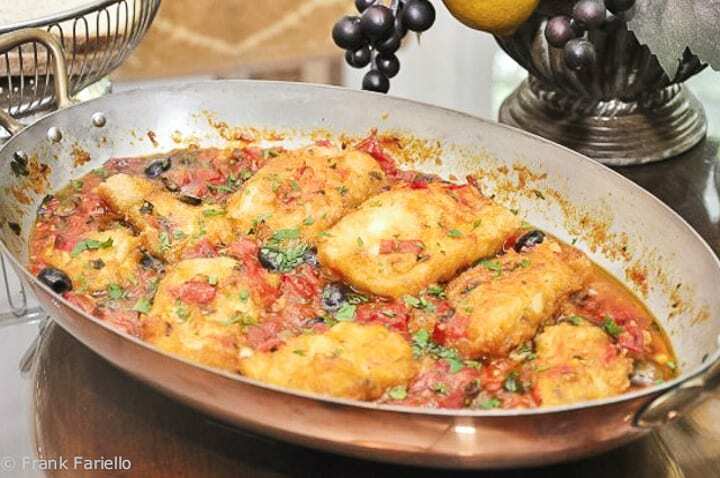 Baccalà alla napoletana, Naples-style codfish, is a simple dish of bold flavors reminiscent of pasta alla puttanesca. You begin, as usual, by soaking the salt cod for up to 24 hours in several changes of water. Drain the cod, pat it dry, and cut it into serving pieces. Now make your sauce, in a skillet or flame-proof baking pan, by very lightly sautéing a soffritto of chopped garlic and parsley in olive oil until it just begins to give off it fragrance. Immediately add roughly chopped very ripe tomatoes (or, the in winter, canned tomatoes) and simmer gently. When the tomatoes start to melt into a sauce, toss in a handful each of capers—preferably the salt-packed kind, rinsed and dried—and olives—preferably the small black Gaeta or Niçoise variety. While the sauce is simmering, lightly flour and fry your baccalà pieces in olive oil until they are lightly browned. As they brown, transfer them to the pan or skillet with the sauce. When all the baccalà has been added to the sauce, take a spoon and nap a bit of the simmering sauce over the fish pieces. Now you have a choice: you can continue simmering the dish over the stove, or you can place the dish in a hot oven (200°C, 400°F) for 10-15 minutes, until the sauce has reduced to a nice consistency. I like the oven method, as serving the baccalà direct from its baking dish makes for an attractive presentation at table. Remove your baccalà alla napoletana from the oven, sprinkle with a bit more chopped parsley for color, and serve with some nice, crusty bread. For some pointers on buying and soaking baccalà, check out this post. For tips on selecting the best canned tomatoes, see this post. Even after soaking, you may find that the texture of salted codfish is a bit firmer than you like your fish to be. If you prefer a softer texture to your baccalà alla napoletana, poach the codfish pieces for five minutes or so, drain and let them cool off before flouring and frying them. Remove the dish from the oven, sprinkle with a bit more chopped parsley for color, and serve with some nice, crusty bread. The baccalà is soaking, the pan forte and chestnuts have been purchased for tomorrow. My mom made bacala three ways on Christmas Eve. She would make a simple salad of steamed bacala with oil and lemon, another way floured then fried, and finally with olives, capers in tomato sauce as you shared in this post. Someone else mentioned potatoes in their Mom’s recipe and I think sometimes my Mom added potatoes, but not always. They all sound nice, Joann! I also have a recipe for boiled baccalà salad and fried baccalà that sound a lot like your Mom’s. Thanks for your comment and Merry Christmas! I love this recipe. It is spot on to what my mom made. I love your flipboard Magazine. I have been fooling around with ibook author and just wondering what program you used to create it. Also enjoyed the interview. No program needed. Just go to the Flipboard website and follow the guides. It’s a snap! oh this reminds me so much of my mum. She made it so good and I have never been able to replicate her recipe. I will surely try this one when I have time. Thanks so much, Letizia. It’s a wonderful, homey dish. If you try this recipe, do let me know how it comes out. By the way, I have to give you special thanks: You were the very first person to leave on comment on the new website! We love baccala’ in various ways: stewed with potatoes, roasted and fried. Thanks, Anonymous! I'm sure this goes very well with potatoes or polenta. Parsnips… I'll have to try it some time! I have made thiss for many years. The hard part was finding the dried salted cod fish at times. Its great with potatoes but my family always served it with roasted parsnips or polenta. This looks almost exactly as I remember it, except I always had it with potatoes added. I'm going to try it but I'm going to add the potatoes. now thats home cooking!!! what a perfect meal, its been so long since I have had Baccala! Oh my, your recipe has really made me hungry. IT looks and sounds just perfectly mouthwatering. Che bello. I wish I were not the only one in my household to love baccala, but so be it Baccalà e stocco al forno was our Calabrese Christmas special, roughly the same dish as yours, except baked, along with wedges of potato. My dad and i loved to use the thick, oily pan sauce on bucatini. His home town in Calabria, Cittanova, is famous for its Sagra dello stocco. Gorgeous I everyway. I have yet to cook with salted cod myself but love the flavors and your recipe will be the first I try. I have salt cod and have never cooked with the preserved fish before. Your Italian dish is inspiring and one I would like to jump in to enjoy a new kitchen experience. What a beautiful post and great idea for the summer. Tomatoes are indeed stunning now- even in Colorado- and this dish seems like a great use for them. I don't think I have had the Italian version of this but I do remember a similar creation in Spain- it was fabulous! I would love to eat everything you make at home. My husband loves fish but he doesn't like it cooked in sauce. I, on the other hand, would gobble this up. Thanks for sharing. this looks so beautiful, I am thrilled to try this out to surprise my husband with! I lived south of Naples for a bit during my summers between college – this brings back such delicious memories! Thanks for the inspiration to cook something Mediterranean! Frank, I will need to try this recipe. It looks wonderful! Oh, it looks and sounds so delicious! And I love your pan! this brings back such memories. Bacala fights. My dad liked it, mom didn't. lovely looking Frank.